Yesterday I received the phone call that every horse owner dreads “Scottie has had an accident in the field and has hurt himself.” I was on my way back from visiting Jack, an hour and half drive away from the yard. Luckily I was almost home when I received this call and 20 ish minutes later I was walking across the field to where some girls from the yard were standing with him. 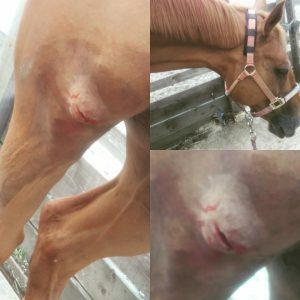 He had a deep wound just above his stifle and didn’t want to put weight on it, let alone walk on it. Luckily there is a fantastic group of girls at the yard who had rallied round to help. One of the girls is an equine vet (although she doesn’t practice anymore) but she drove home to raid her drug supplies to give him some pain relief until my vet could arrive. These drugs allowed us to coax Scottie into taking a few steps towards the yard and after these first few steps, he realised it wasn’t as painful to walk as he thought it was and we hobbled slowly back to the yard. This pleased our vet friend who said if it was anything too bad/serious he wouldn’t have walked in that well with the painkiller she had given him. By the time we got him onto the yard and had a bit of a better look at the wound our vet had arrived. She had a quick look and watched him hobble away 5 meters and back before getting to work. She sedated him so that she could get a good look at the wound and have a good poke around to see exactly what he had done. Luckily, he had just missed (by milometers) both the stifle joint and the patella. So as long as no infection develops, we have managed to avoid the worse case scenario! We do however have a muscle tear going down to the bone, although the bone doesn’t seem damaged so it appears it has only just reached the bone. It had a really good clean, clipped the area, flushed out with saline and had local anaesthetic before having 4 stitches to help close the wound. After two big antibiotic injections the vet was done for the day. She gave me two options; for her to come out again today and tomorrow for more antibiotic injections or for her to give me oral antibiotics to put in his feed. This was an easy choice for me, it’s very close to the joint and he is insured up to the eyeballs. So I went for the expensive but safer, recommended option of two more days of antibiotic injections. It’s still too early to say how long it will take to recover, but as long as no infection sets in, there is no reason he won’t make a full recovery. I will have a bit more of an idea when the vet comes back out to see him today. But once his antibiotic injections are over, he will probably be on oral antibiotics for at least a week plus bute. His stitches should be coming out in the next 10-14 days and if the vet said that if there is infection we should know within the first 7 days. So if it’s still looking okay on Saturday then we should be all clear. I’m really pleased to have a vet on the yard who I can ask to look at him every day to catch any early warning signs of an issue. Obviously this has put a lot of our plans for the next month or two on hold. While the vet seemed positive that we will be back to work in September, I don’t want to push anything and muscle can take a long time to heal. So in the mean time, this could be the perfect time to start experimenting with clicker and target training which I mentioned in a previous blog post. It will keep his mind busy and give us both something to do. I will keep you all updated on Scottie’s progress and hopefully he will have a speedy recovery and not get too fat during his time off! So sorry that Scottie was hurt but I’m so glad that the prognosis is good! No one wants to get that phone call- ever. Poor boy! 🤕 I wish him a speedy recovery! The things they get up to in the field there can be no prevention for horses being horses. Hope Scottie is feeling great again soon. I’m sorry he got hurt, glad the worst is avoided. Ah, lovely when it works out! These injuries are so scary! I am glad it wasn’t as bad as it seemed! Praying for you guys that there won’t be an infection!